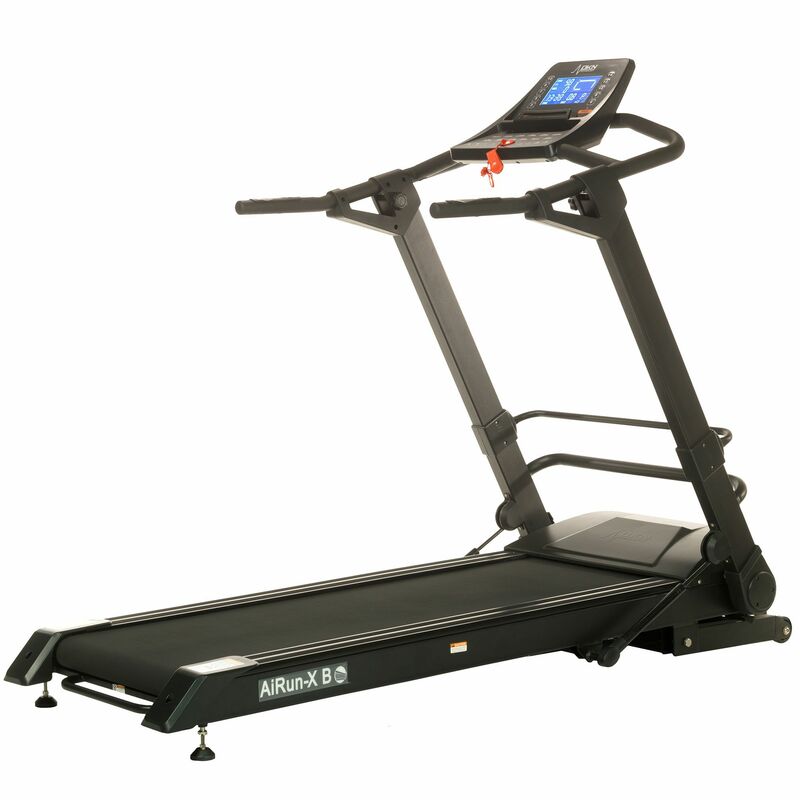 The DKN AiRun-X Treadmill is one of the most impressive performance treadmills ever designed offering a revolutionary folding mechanism, where it neatly folds away and can be stored vertically in a cupboard or even horizontally under a bed! Despite its compact nature, this treadmill is a ‘true’ running machine, powered by a 2.25 HP continuous/4 HP peak motor that speeds the belt up to 12 mph and up to 15 levels of incline so you can vary the intensity of your sessions. The AiRun X has a luxuriously thick running belt over large 60mm rollers which puts less strain on the motor and allows a smoother and quieter performance. 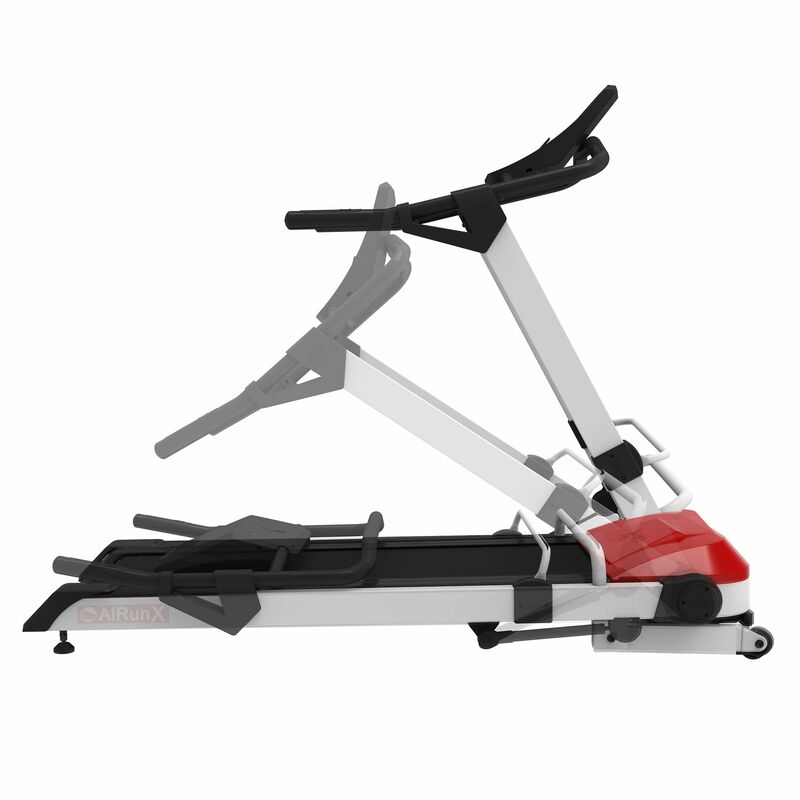 This combined with DKN’s ‘Progressive Shock Absorbing’ system deck which responds with every stride to maximise cushioning and support, while the integrated hydraulic shock-absorbing system enhances comfort. 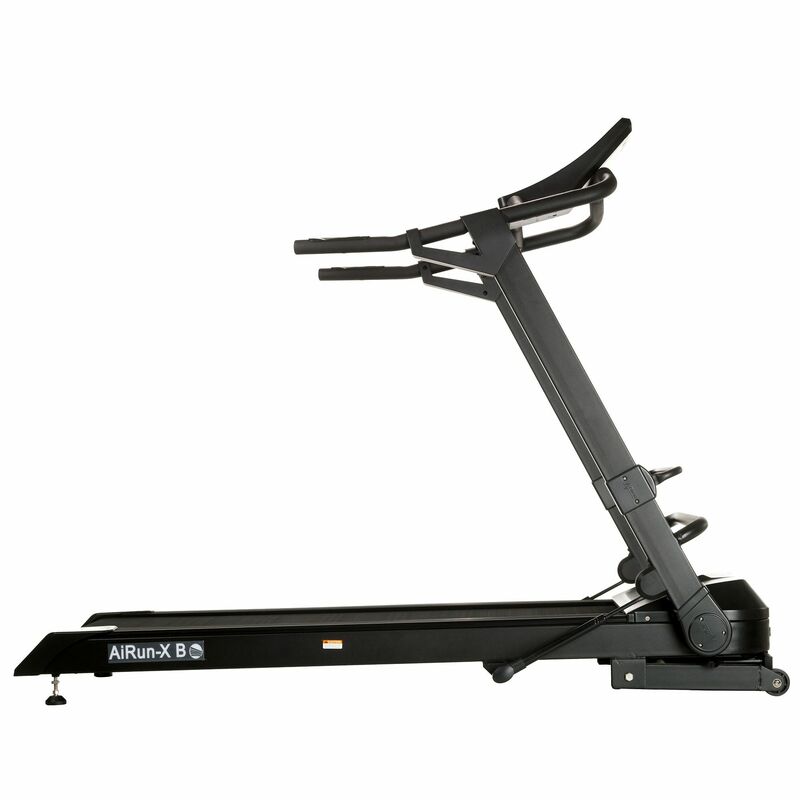 The AiRun-X offers 12 unique pre-set course profiles, the option to create your own user program, 2 user profiles to customise workouts by inputting your personal data to accomplish more accurate feedback and an inbuilt receiver that wirelessly connects to a compatible chest strap transmitter (not included). 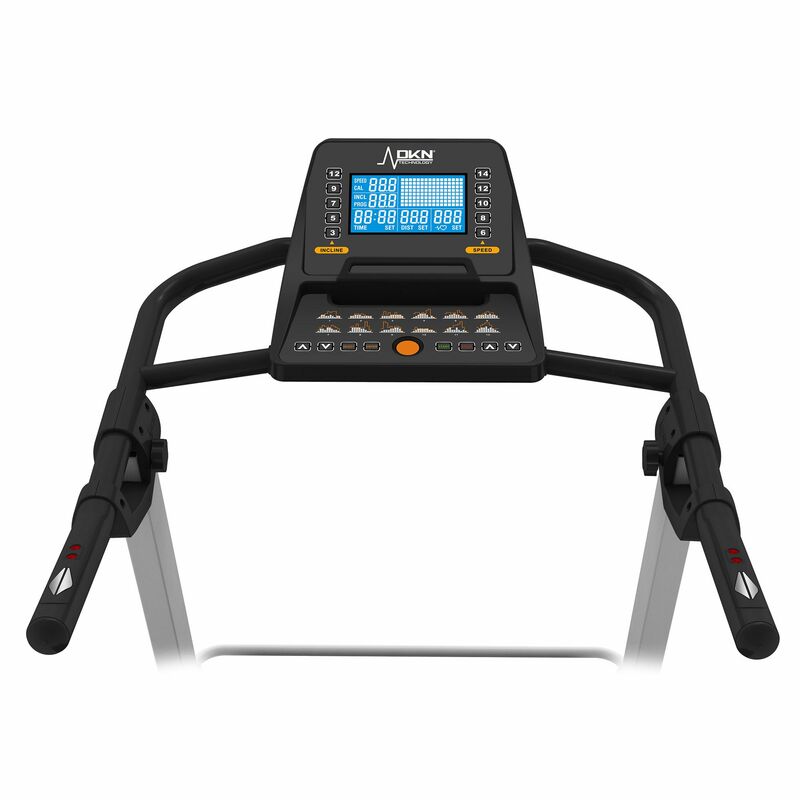 The LCD console provides constant feedback on all workout data, including speed, time elapsed, distance covered, calories burned, incline, 400m lap runs and heart rate, enabling you to stay on track of every session. 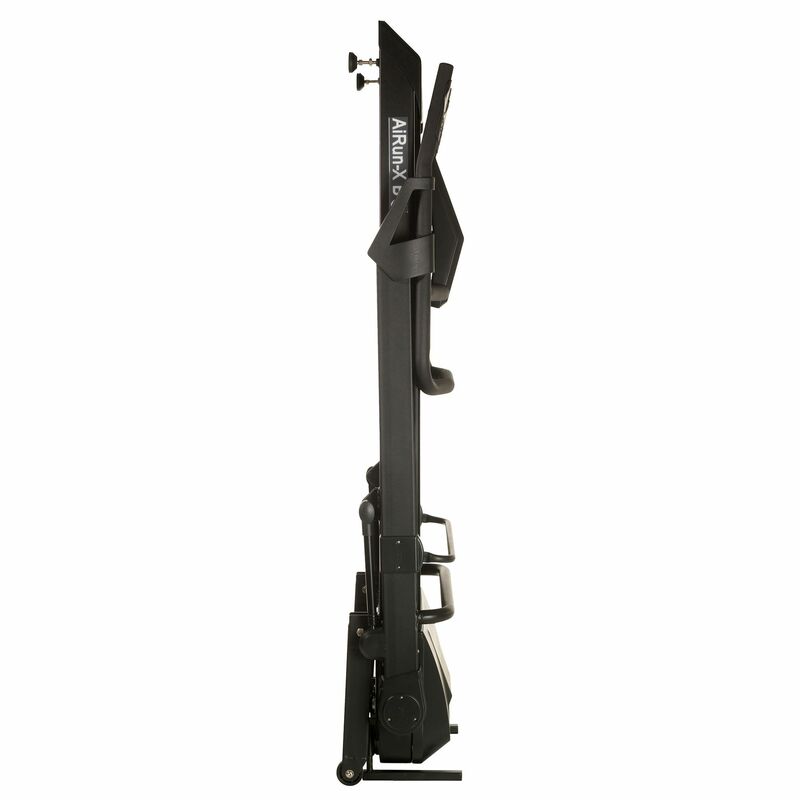 The AiRun-X provides a sea of possibilities due to its compatibility with an iPad or Android tablet. The Kinomap application gives you access to thousands miles of live action videos posted by the Kinomap community, as well as lets you join scheduled multiplayer sessions and browse energizing playlists. 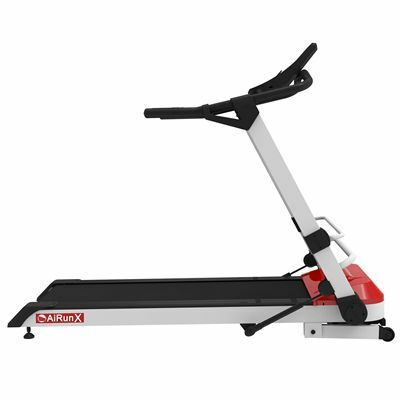 I researched for what seemed a lifetime for the right treadmill that was space efficient and sturdy at the same time. I have had many treadmills in the past that were either tiny and flimsy (loud!) or sturdy but took up half the room. This treadmill is the happy medium. It is a bit tough to fold up but when you are using it, it is a dream. 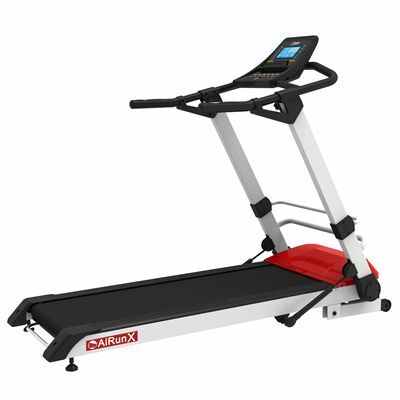 Nice and quiet and doesn't wobble about under your feet when you are doing your run. Using this all the time with my husband and we both love it. Really can't fault this machine. This is the first treadmill I have ever owned and so far I'm very happy with it. 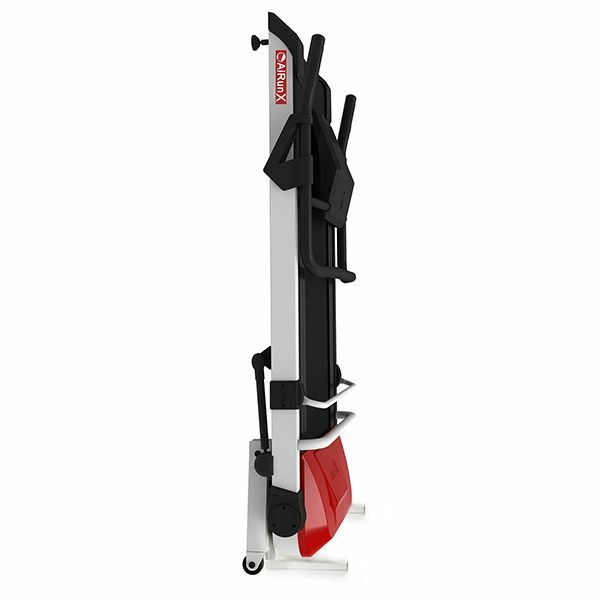 We've been using it 3 times a week for a few months now and definitely can feel an increase in our fitness levels. The DKN Run app is great fun as you can run routes all over the world to mix it up. Overall very pleased. Purchased the machine for family use to keep us all fit. It has been no bother. 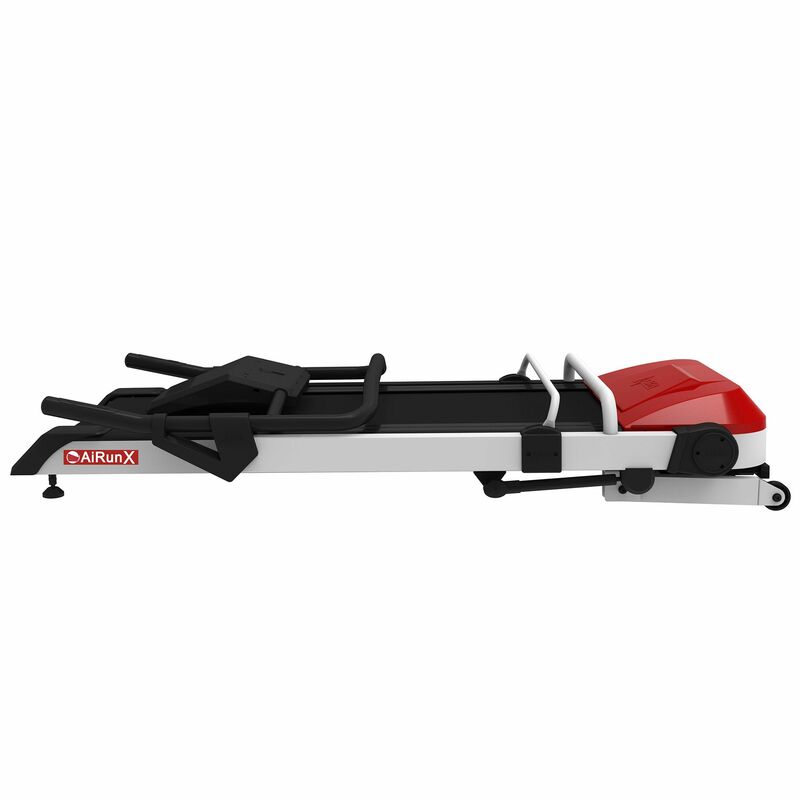 I went for this machine over others because it has great cushioning, great specifications & folds up very neatly. The build quality is excellent, made of thick steel. The treadmill is exactly as described online. We are truly pleased with our treadmill. We use it on virtual runs via our ipad app often and this makes running so much more enjoyable. The console, cushioning, build quality all excellent standard. The machine is sturdy and doesn't wobble when used at top speeds. Delivery was prompt and the service provided was impeccable. Shop staff very helpful,I placed the order on Wednesday, the treadmill was delivered on Saturday, only took 10 mins to unpack and set up, the motor is very quite, with plenty of power, It would be a good idea to make the bolts that secure the consul in place spring loaded & the speed up buttons and heart rate sensors need to be further forward,having said that I am VERY happy with my purchase, if you are a serious runner this is the treadmill for you I am training for a marathon and have been on the treadmill for an hour at a time, it is very comfortable too, I am 5.9 and find the deck is long enough for me. the design is fantastic if you are short on space, it does fit under our single bed when not in use. Features that helped me to make up my mind when buying the AiRun X are definitely its folding system and small dimensions. Purchased it with a focus to improve my general fitness and energy levels. I believe having a treadmill at home makes it much easier to hit the target. I’m trying to run twice a week for around 1 hour on a Manual programme and add incline to my workouts for better results. Assembly didn’t cause any problems as the information in the manual is clear and intelligible. The only problem I’ve had with the machine was a small leak from the incline system, which I’ve managed to fix myself. We bought the DKN AiRun X treadmill as a Christmas gift for our daughter, who trains track and field as a winter training option. We decided to go for this treadmill after reading reviews sites, checking the specifications and factory flaws. Managed to install it in less than 2 hours with the manual. As soon as we were done with the assembly, we tried some of the pre-set programmes and checked the incline system. Everything seems to be perfect. As it is a Christmas gift, we have to hide it in the basement - packed in the Christmas wrap. So far so good and now we are waiting to start running regularly. 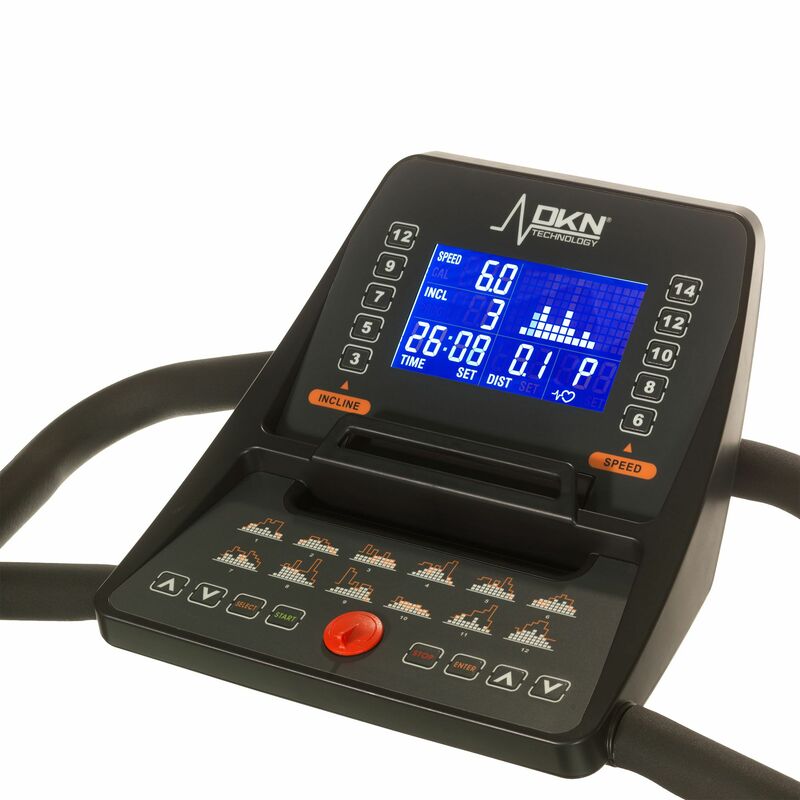 for submitting product review about DKN AiRun X Treadmill.